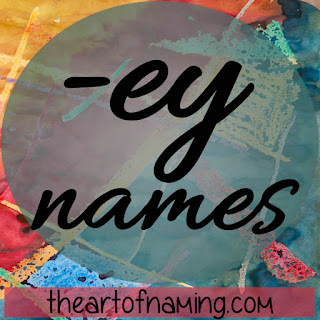 The Art of Naming: Names Ending with the Letters "-ey"
Names Ending with the Letters "-ey"
We've explored letters A-D so far in this "ends with -y" series. Today's list is perhaps one of the most plentiful. It was difficult to narrow it down to only the best options that end with the letters "-ey". The names below all have their endings in common, but they differ greatly in terms of style and popularity. Let's play a little game with these names. Let's suppose that you are having triplets and you have your heart set on cutesy rhyming names for them. Choose three that you like most, and give them their own middle names. You can choose either the gender combinations. Have fun! Can you think of any "-ey" names that I missed? 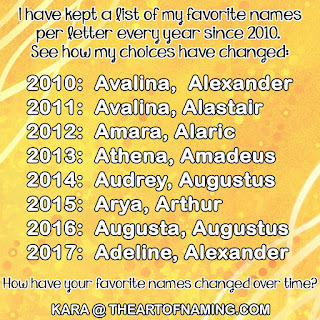 Share them below (along with the names you chose for your fictional triplets) and I'll add them to the list! Here's the triplets that I would name: Ramsey Oliver, Audrey Juliet & Zoey Claire. You?